St Andrews Parish Church Fontmell Magna. We offer a variety of worship services and we are always pleased to welcome visitors and new-comers. To find out more about our historic church please follow this link or go to this map to find us. Open House: Coffee and Chat, all welcome. The Parish of Fontmell Magna with Bedchester nestle in a rural setting in an area of outstanding natural beauty. There are thatched roofs and a meandering brook, arising from “Springhead” which is a centre for creative and sustainable living. The run of mills, ponds and bridges are a feature of the village. The village benefits from a shop with post office, pub and school and employers include builders, thatchers, farming and gardening trades, while the retired section of the community make a huge contribution to the life of the parish. 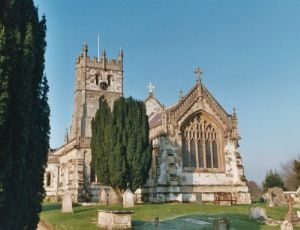 The Parish Church, is positioned high, overlooking the village, set in an award winning churchyard and maintained in a beautiful condition. It is kept open daily by volunteers, inviting and welcoming local people and visitors to come through its doors for quiet reflective prayer, to view the interior and to experience the atmosphere of spirituality. The sound of church bells rung regularly, plus the clock and carillon, are cherished by the villagers who have helped financially with repairs. Practical care of the Church property is supported by people well beyond the regular congregation. Those who do not regularly attend services at St Andrew’s regard it as their church for baptisms, weddings and funerals and many attend services at major festivals. Special events such as concerts and the teddy bear parachute jump are well supported. The church has a social committee which organises refreshments after the services, caters for special events such as the church meal on St Andrew’s Day and refreshments at concerts. They are also responsible for “Open House” which meets in the Church once a week during the summer and once a month in homes during the winter: this provides an opportunity for the whole community to meet for coffee and a chat. The church supports many charitable causes and give 10% of its general income to designated charities. It also regularly supports and takes part in the Dorset Historic Churches Trust’s Ride & Stride event to raise funding for church buildings in the county. We have an average attendance of 35 at 10.00am services and 15 at 8.00am services and enjoy a flourishing homegroup, where we study the bible, discuss and learn and pray together – and eat cake! We are trialling a new Breakfast Church in Fontmell the Breakfast Church event happens every month at 9am and is held on the First Sunday of each month in the Village Hall, a hot breakfast is served with Coffee or Tea, Toast, croissants etc and all are welcome. The first half of the event is taken up with Breakfast and good company after which we have a 'Thought for the Day' All are welcoms and this is particularly conducive to families with young children. The school visits the Church for many and varied services and events. Last year in the Church a very successful ‘Christmas and Easter Experience’ which was prepared by members of the benefice and presented for the top two classes of the school. We value this link and enjoy making our contribution to the life and worship of our local Church School. As a church we feel we have a duty to serve the whole community. Whether or not you are a church member if you need support in any way please let us know. Our Vicar The Rev'd David W John will be happy to help in any way he can. Set up high in the centre of the village, the majority of the present church of St Andrew was rebuilt in 1862/3 by Sir Richard Glyn, the Lord of the Manor, who owned most of the village and also provided it with what is now the Church of England Primary School. The lower stages of the tower date from the early 15C and, re-set in the north wall of the north aisle, are four restored 15C windows. A third stage was added to the Tower in the re-build to house the Ring of 6 bells. Built of mainly greensand ashlar it has been described as one of the handsomest churches in the diocese and has a number of interesting architectural features. In particular, under the battlements surmounting the original South Porch, were a variety of bas-reliefs and ornaments and the word "O Man Kyn bare tho y myn", followed by 1530 in latin numerals. Designed by G Evans of Wimborne, the church consists of a wide nave, chancel and sanctuary with two side aisles. The small St Martin's chapel was created at the east end of the North Aisle in 1957 and behind the 17C Communion Table the war memorial is carved in the wall. Of unusual interest is the 16C carved oak screen beneath the tower arch, highly decorated and with a scroll around the edge which reads "Water King and Esbell his wif." The single hammer beam roof is cross-boarded. The Capitals of the gothic style arches in the nave and side aisles host a variety of finely carved angels and other figures. The floor is tiled, the sanctuary tiles being a fine example of Pugin's work. There are a number of good quality stained glass windows including the East, being by Clayton and Bell, and two from the 20th century. The Tower houses a clock, made by William Monk in 1732 with Carillon (believed to be the work of John C Brine in 1750) which, every three hours, plays the hymn "Hanover" and a Ring of six bells, of which Nos 5 and 6 (Tenor) are mediaeval and Nos 3 and 4 of the 17C though No 3 (1641) was recast in 1912.